In 1888, just beyond Spring Hollow on the road to Cyrene, Ezra Kirkland built as fine a house as the village of Bowling Green had seen. It was a handsome place, bordered by cornfields, cow pastures, and a grand grove of messy locust trees. The honey locust tree bears a pungent brown seed pod, looking like a twisted leather strap, called a honeyshuck. Kirkland’s house had a limestone foundation, so the cellar was damp and the house was musty. It still is. On the first floor there was a parlor, a living room and a library, a dining room and a kitchen. There was a narrow stairway to the second floor where there were four bedrooms, three of them not-so-private. The house was heated with a half dozen fireplaces, water was drawn from a cistern, and there was an outhouse at the edge of the garden. The exterior was fancy enough with jig-sawed bargeboards in the front gables and a copper gutter built into the roof. 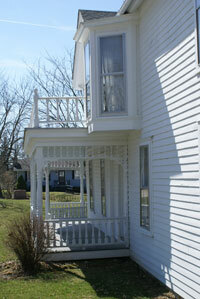 Two front facing windows had stained glass inserts and the three doors from the porch had beveled-glass windows. A cast-iron fence greeted visitors who tied their carriage horse to an iron ring in the curbstone! Coming inside, there was no grand staircase, no hardwood floors, but some appealing woodwork: broad baseboards and milled moldings around the doors and windows with both wheat and target patterns. The doorknobs were, alas, not glass, but metal, sometimes enameled, ceramic at best. In contrast to the mansions in nearby Louisiana, Ezra Kirkland’s house would be a bare example of Folk Victorian architecture with Carpenter Gothic features. It was elegance-on-the-cheap: there is nothing cataloged above that couldn’t be shipped to Bowling Green from Sears, Roebuck & Company in Chicago! 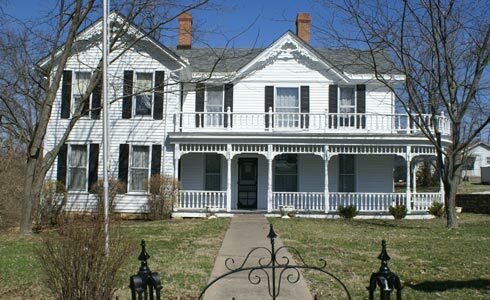 In 1898, the house was purchased by the Congressman from Missouri’s 9th District. Confident of a long-run in the House of Representatives, Champ Clark, his wife, Genevieve, and their two children—Bennett and Genevieve—moved into the house across Spring Hollow. In January, 1899, the papers were signed in Bowling Green and Washington, D. C. and the purchase of the property recorded in the Pike County Courthouse as belonging solely to Genevieve Clark! 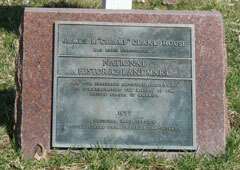 The Clarks bought the house as a Missouri residence, with no thought of living here year-round. With the obligations of office, they would be going back and forth between Bowling Green and Washington. In their absences, there would be an occasional caretaker to keep the place up and the mice down and, a few days ahead of the Clark’s returning, to open the windows and air out the mustiness. Champ and Genevieve named their new home Honeyshuck—for the seed pods of the locust trees—and set about to establish it as the center of social hospitality and political activity in Pike County and northeast Missouri. They would host an annual open house for the 9th District. In 1911, thousands attended a great homecoming picnic for the newly elected Speaker of the House. Champ invited everyone in the State of Missouri to his daughter’s wedding in 1915,… and 12,000 people came! In the first five years, Champ and Genevieve made two major improvements. In 1902, they traded the chamber pots for indoor plumbing! And they added a single story addition, providing an office from which Clark could maintain his law practice and a stack room to hold his growing library. Over the next twenty years, oil lamps were replaced by gas fixtures, then gas/electric combinations, and finally all-electric lights. The fireplaces gave way to a coal-fired furnace in the cellar and the cistern pump in the kitchen was replaced by iron spigots. The ice-box made way for a refrigerator and The Speaker of the U. S. House of Representatives quit milking his own cow for the back-porch convenience of bottled milk, delivered. When Congressman Clark died in 1921, his widow returned to Bowling Green and Honeyshuck. Genevieve presided from the parlor, a gracious hostess, convening a literary club and founding The Honeyshuck Society, a women’s group active in party politics! She reached the infirmity of old age and died in 1937. And this old house entered a new chapter in its life. Bennett and Genevieve took but a few items from the house of their childhood. The pipes were drained, the furnace shut down, sheets draped over the divans, and Honeyshuck closed up. 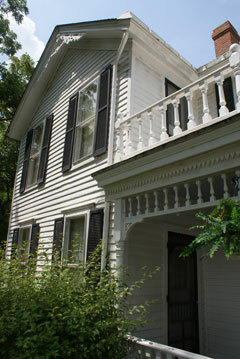 In the spring of 1944, Bennett and Genevieve sold the property to Kenneth Meeks and his wife, Juanita. Long-time friends of the Clarks, the Meeks had plans to restore the house and make it their own family home. But three years earlier, the War Department had contracted with the Hercules Powder Company of Wilmington, Delaware, to build and operate a weapons plant in Pike County. Hercules brought their own workforce to build and run the plant and housing for these workers was at a premium. Whatever plans the Meeks had gave way to provide housing for the workers at the war plant. The Meeks moved into the house with hammers in hand. Living on one side and working on the other, they divided this old house into four apartments. Each would have its own kitchen and bath, the upstairs units with outside entrances and wobbly wooden stairways. It was surely the end for Honeyshuck as the Clark’s historic home. Finishing the work and letting the rooms, the Meeks moved back to their own home on North Main Cross. Within a year-and-a-half, the munitions plant suspended production, the workforce moved back to Delaware, and the apartment house across Spring Hollow was left to live out its usefulness as a rental property. The first tenants were young families. It became a boarding house for single men. It took a turn as a nursing home. In the mid-1950s, the Meeks tried to find a buyer with the resources to restore Honeyshuck. ; There were no takers. 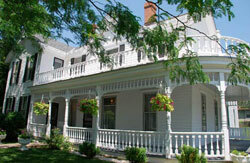 In 1957, the property was sold to Bill and Pat Robinson as an income property. By the late 1960s, the costs of upkeep became prohibitive and again the utilities were shut off, the shades drawn, and the doors locked. In the first term of the 93rd Congress (1973) and suddenly aware of Clark’s political legacy, Congressman Bill Hungate, from Bowling Green and Missouri’s 9th District, found that the house was still standing and might be for sale.Hungate set in motion his own purchase of the property and then its transfer to a non-profit corporation he called Champ Clark Honey Shuck Restoration, Inc.